​An Comunn Gàidhealach staff are now back to work after a week off following another very successful Mòd in Lochaber. 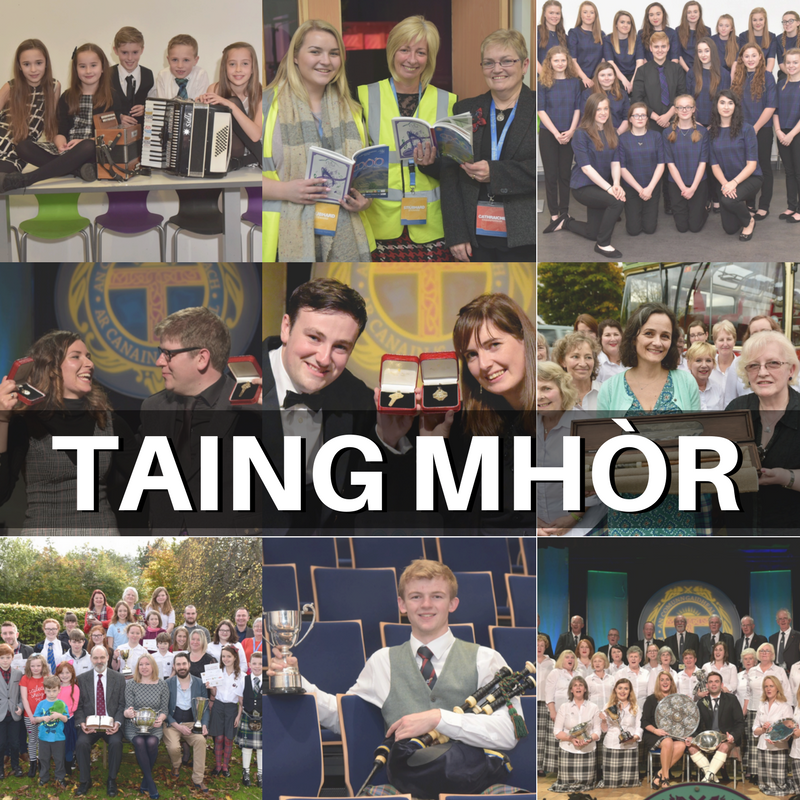 A big thank you again to everyone who was a part of this year’s Mòd: An Comunn Gàidhealach Board of Directors; all who supported our staff in the Mòd Office and Information Desk; the Local Organising Committee; the stewards; our sponsors; our adjudicators and chairpersons; all of the competitors and those who came to watch them and the people of Lochaber. There would not be a Mòd without your support. We hope that you all enjoyed the Royal National Mòd in Lochaber this year and we look forward to seeing you in Dunoon between 12th and 20th of October 2018 for another celebration of our Gaelic language and culture. Remember that Official Mòd Photographs can be purchased from Graham Hood’s website here. If competitors are held up in a competition, delaying them from another competition, it is important that the Chief Steward is alerted. The Chief Steward will then make sure that the information is passed on to the Chief Steward of the venue of the competitor’s next competition. Competitors are not allowed to consult books, manuscripts or copies or music during competitions with the only exception to this being the instrumental competitions. The Mòd Information Desk will be situated in Lochaber High School on Saturday 14th, Monday 16th and Tuesday 17th October and in the Nevis Centre between Wednesday 18th and Friday 20th October. Tickets and Mòd Programmes can be bought or picked up here. Adjudication sheets for competitions will be available for collection at the Mòd Information Desk in Lochaber High School on Saturday 14th, Monday 16th and Tuesday 17th October and in the Nevis Centre between Wednesday 18th and Friday 20th October. Note: Competitors should allow a minimum of 2 hours after end of competition before collection of adjudication sheets. Prescribed Pieces for Mòd 2018 will be available at the Mòd Information Desk in Lochaber High School on Saturday, Monday and Tuesday and in the Nevis Centre between Wednesday and Friday. Please note that there is no parking for Mòd events taking place at the Lime Tree. The spaces available at the venue are for use exclusively to disabled users. However, there is parking across the road, adjacent to the venue in the ‘West End Car Park-Long Stay’ (marked No. 1 on car parking map). 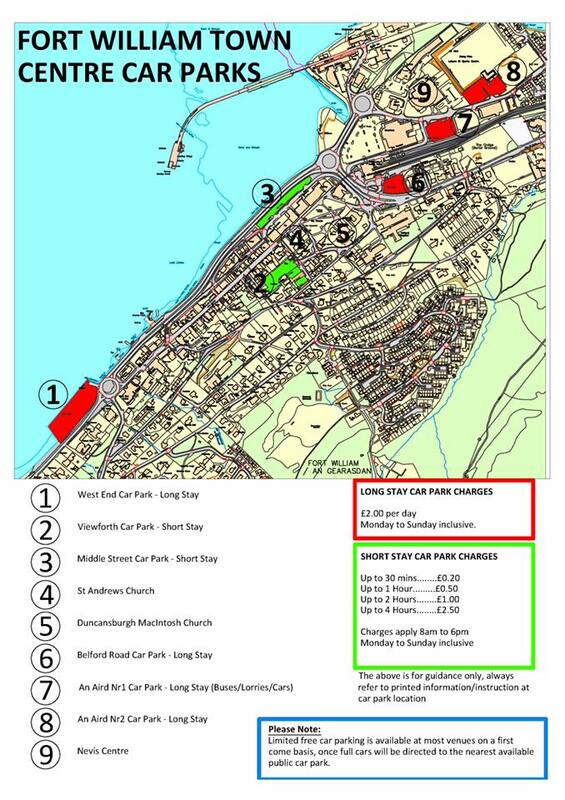 Please note that Highland Council car park charges will still be in force during Mòd week. Make sure you are following us on Twitter and Facebook to keep up with information during the week of the Mòd. For further information on Mòd rules and guidelines, competitors should consult the relevant section of our website.